Market at the Square is revving up. June approaches, and with it the promise of a wider variety of local produce. Yep, it's strawberry season. This weekend, the Market will have several vendors selling different varieties of these totally luscious berries. Check rows 1, 2, and 4 of the Market. Time for shortcake! And muffins! And jam! And...! Other produce: asparagus, peas (snow and sugar snap), salad mixes and lettuces, spinach, rhubarb, hydroponic tomatoes, pickling cukes, fresh herbs, chard, radishes, and I'll be danged if we don't see some blueberries lurking (arrive early). Last week's Sprouts event was a success, with many kids learning about (and tasting!) seasonal, local food. When one of your Sprouts informs the workshop leader that her favorite vegetable is arugula, you know you need to be on your game. It was a good time, and we have more good times scheduled - the next Sprouts event will be on July 25, and of course we'll post information well in advance. 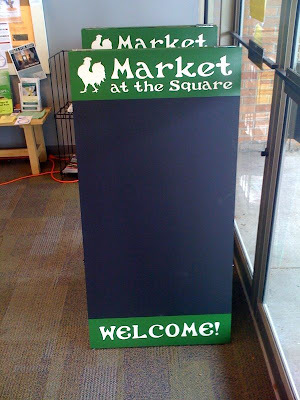 This week's special event: Art at the Market! After last October's very successful mask-making workshop, Urbana Public Arts Program coordinator Anna Hochhalter decided that more frequent partnerships between the Market and Urbana's Public Arts Program made perfect sense. The first collaboration of the year will be a free ceramics workshop, open to all ages, this weekend at the Market between 8 AM and noon, with local sculptor Suzanne Berkes facilitating the use of clay to create art exploring the theme of water. All materials and instruction are free and open to everyone, and registration is not required. The Urbana Public Arts Program provides opportunities for all residents to engage with the arts in its many forms... so get out to the Market and sculpt! Look for WICD's feature about Market vendors each Saturday on their newscasts at 6 and 10 PM. 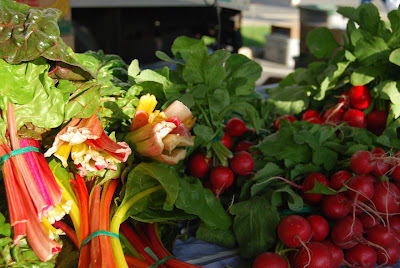 One of the Market's best-loved vendors, Prairie Fruits Farm, starts their Dinners on the Farm season this weekend. There are still seats available for several of the dinners - if you're interested in locally-sourced cuisine cheffed by local talent Chef Alisa, get thee to the Farm! Dinner there is worth every penny. See everyone at the Market! This weekend marks our first Sprouts at the Market event for the 2009 season. Sprouts is "nutrition and farm stuff" for kids age 4-10, and is designed to get them interested in eating healthily AND locally. - If your kid can't make all the events, don't fret - t-shirts will be for sale all season long! Behold what will soon become additional bike parking at Market at the Square! We'll be adding close to 40 additional spaces and they're located directly adjacent to the Market on the west side, along Walnut Street. The spaces, which will have a few decorative racks amongst the more utilitarian U-racks you're familiar with, are also located very close to where our ZipCars are parked. This week - strawberries, asparagus, salad greens, fresh herbs, meat and cheeses, flowers, art, crafts... it's going to be a good weekend. So - last weekend's Market was warm and sunny, but it was also WINDY as all get out. Still, thousands of you came out to see what was going on. Thanks for making the Market part of your Saturday morning ritual! Book signing this week: I mentioned this awhile back - this week we'll have Joe McFarland, one of the authors of Edible Wild Mushrooms of Illinois and Surrounding States, coming in this Saturday from 9-11 at the City tent to sign and sell copies of this gorgeous (and useful) book. You can pick up a signed copy of the book for the special Market rate of just $20! Don't miss it! Sprouts at the Market: Our food and farm program for kids ages 4-10 kicks off its 2009 series next weekend - Jen Hewitt is back to lead these workshops that are designed to get kids interested in local food and farms. There'll be four Sprouts events this year, and kids 10 and under completing all four events (they're happening in May, July, August, and October) will receive a free Sprouts at the Market t-shirt! We'll also have shirts for sale, so even if your Sprout can't make it for all four events, they can still sport some gear. Look for more info about this year's Sprouts events early next week here on the blog, or you can consult the Sprouts page on the City site or Facebook. See the sidebar for links. **** Dogs are allowed at the Market, but they must be on short leashes and their best behavior. Please clean up after your dog promptly. Thanks! **** Smoking is not permitted within the perimeter of the Market. Last, but not least - complimentary coffee is back at the Market this week, thanks to generous support by Hanford Inn & Suites on North Cunningham in Urbana. Thanks, Hanford Inn & Suites! OK, then. Don't let the possibility of a little rain scare you - get those umbrellas out and come see us! 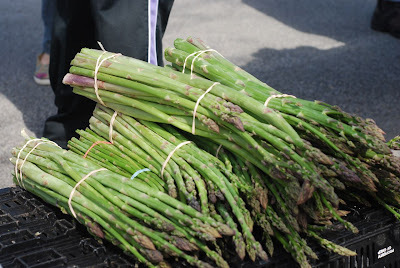 Last week's Market was a slam-dunk - the weather was wonderful, everyone was out and about, and the food was plentiful (especially asparagus). Thanks, to everyone for coming out! There'll also be goat cheese, lots of meat and eggs, plenty of baked goods (including Stewart Pequignot, whose bagels, breads, and granola bars were often asked-about last week), flowers, plants, art and crafts (local batik artist Jill Miller will be putting in an appearance this week, among others), prepared foods, coffee, etc. My favorite part of the Market day this year will be - well, all of them, but especially breakfast. Why? Because The Great Impasta comes to the Market while you're still sleeping, shops for the morning's breakfast ingredients, and will have omelets and who knows what else available over at the restaurant (in Lincoln Square, in the previous Milo's location) starting at 8 AM. Last week I had a 100% local omelet breakfast that included eggs from Country Cottage Farm, Chard from Blue Moon Farm, asparagus from... someone, and goat cheese from Prairie Fruits Farm. The sausage? From Triple S. YUM. Impasta's outdoor seating will be in full effect, too. Two other things - Common Ground Food Co-op, located just to the northwest of the Market, will be having its annual plant sale on their patio during the Market. Several plant sales are happening within Lincoln Square Village, too - shopping the plant sales is a great Mothers' Day tradition, so get on over there. ALSO - the Urbana Business Association is launching Second Saturday - a new event held in Lincoln Square and Downtown on the, well, second Saturday of each month. Look for antiques and other items for sale in these locations - you can call Susan at 344-3872 for more information. Free coffee: this warm fuzzy will be back later in May - many, many thanks to Hanford Inn and Suites in Urbana for the sponsorship this season. However, it should be noted that vendors within the Market as well as other local businesses sell awesome coffees - some local roasts, some fairly-traded, some organic, all delicious. Make sure to show them some love, too. Dogs at the Market - if you're a dog owner who loves bringing your four-legged pal to the Market, please stop by the City tent (northwest corner of the Market) to grab the EZ version of our policy regarding dogs. Fido and Spot are more than welcome at the Market as long as the basic guidelines are observed. The long version of the policy will be on our website next week. Thanks! I've heard a rumor that Great Impasta will be doing a breakfast based on ingredients found at the Market - might want to meander over there, since it's just north of the Market lot, in the former Milo's location. Common Ground Food Co-op will have special Saturday hours during the 7-month Market season - they'll open with the Market at 7 and close at 9. Yes!